CRN’s mastery of shipbuilding reaches its utmost expression in the new 50-metre superyacht Latona, which has been presented at the Monaco Yacht Show 2018 at the end of September. The Italian Atelier’s latest masterpiece has been custom-built to meet the wishes of a highly selective and determined Owner. Drawing inspiration from the ‘Superconero’ of the 1960s, the new yacht’s technical solutions and the slender lines of the hull have been developed by CRN’s Engineering Department, while the craft’s exterior lines were pencilled by design firm Zuccon International Project, who, together with the Shipyard’s Interiors & Design Department also took care of both interiors and exteriors. With her 50 metres in length, four decks and an underdeck, the Latona stands out for her classical, timeliness profile that further enhances the style and elegance of outdoor areas. The yacht’s interiors are pervaded by a refined Liberty-style mood, a stylish fil rouge that unravels through all guest areas. The streamlined bow and the spacious interior and exterior volumes, in turn, also include some breathtaking areas almost ‘hanging’ over the sea, let the Latona shine in all her endless beauty. 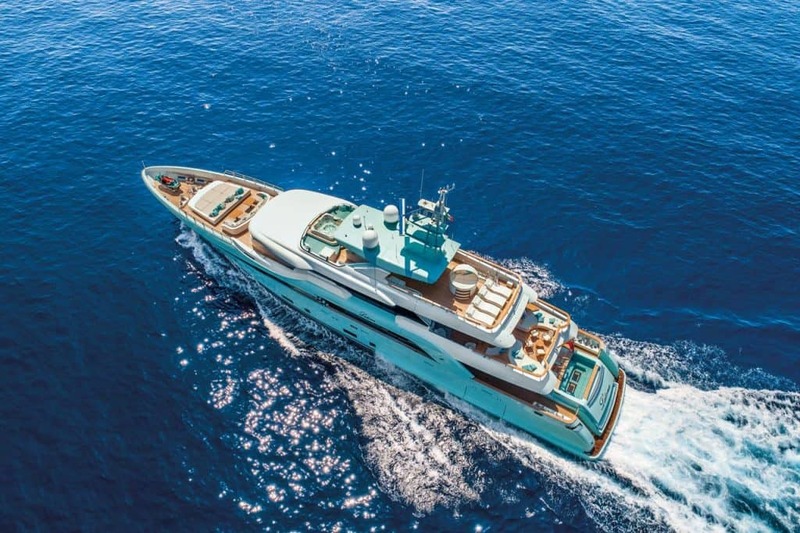 Designed jointly with the Customer, this megayacht has been forged and built to meet her Owner’s request for the utmost customisation, in an effort to achieve pure uniqueness. Onboard the Latona, guests will find numerous outdoor areas – from the wide Mediterranean-style sundeck to the lounge area at the bow, the outdoor living areas and the al fresco dining area located aft to the magnificent terraces overlooking the sea, all the way to the exclusive tender bay obtained on the lower deck. The latter forms a large open-air lounge integrated with the beach club, featuring a solarium, a fitness area, a hammam and a sea-water indoor pool perfect for children to have fun and also ideal to store the tender in the yacht’s ‘belly’ during navigation. And it is just in the interiors that the skilful, refined craftsmanship of the Shipyard and its suppliers has reached its peak, thanks to a painstaking study of the Central European style from the 1920s. This mood now pervades all interiors, starting from the floors, which are enriched by unique decorations chosen by the Owner, like the sinuous dark brown embroidery – a leitmotiv that is found across all decks. 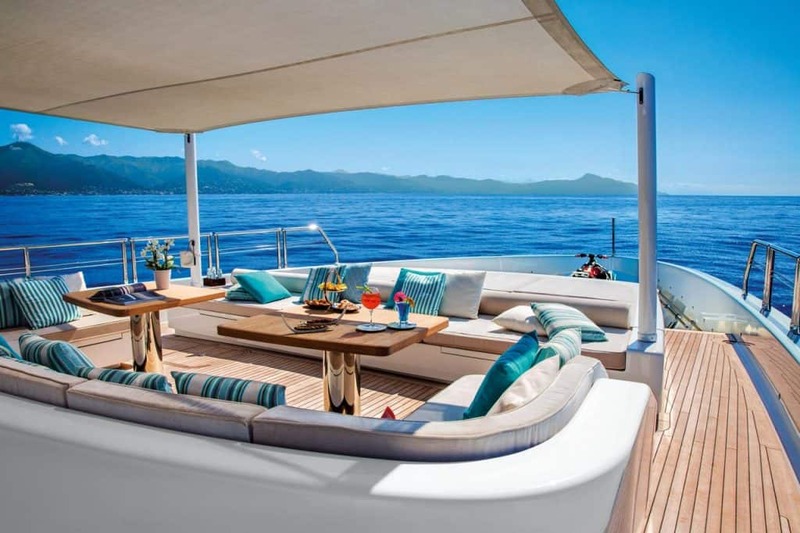 Sinuous lines are, indeed, like a fil rouge accompanying guests in all areas of the yacht. The cockpit on the main deck features large, comfortable living areas and a wide swimming pool with a mosaic that delightfully combines turquoise shades and golden details while also letting plenty of natural light shine through to illuminate the tender bay located below it. 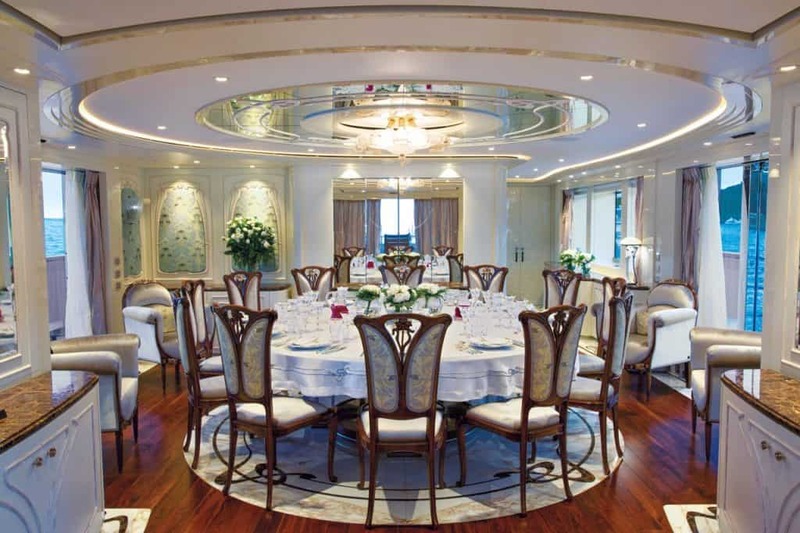 The main deck salon includes a large dining room furnished with a stylish round table in walnut wood with silver decorations and chairs embellished by a floral pattern that will add an exclusive touch to equally exclusive gala dinners. The ceiling-high glazing allows the opening of the dining area on three sides, to dine al fresco and enjoy the breathtaking view from the two sided terraces. As specifically requested by the Owner, the galley has been located behind the dining area, and a convenient hatch has been cut out in the wood panelling, making service even more efficient while being discreet and easily concealed when not needed. Amidship, along the corridor, the 1920s Parisian atmosphere embraces and enchants guests, thanks to the Liberty decorations on the doors and the uninterrupted wood panels decorated with floral patterns that separate the main salon from the lobby and the Owner’s apartment. Slightly further, towards the bow, is the exclusive full-beam Owner’s apartment, characterised by a very original layout. The cabin opens up to a living room furnished with a neutral-shade rounded sofa, a very exclusive and private area for the Owner couple. A distinctive element in this area is the fumoir, a private balcony that can also be enjoyed while cruising. 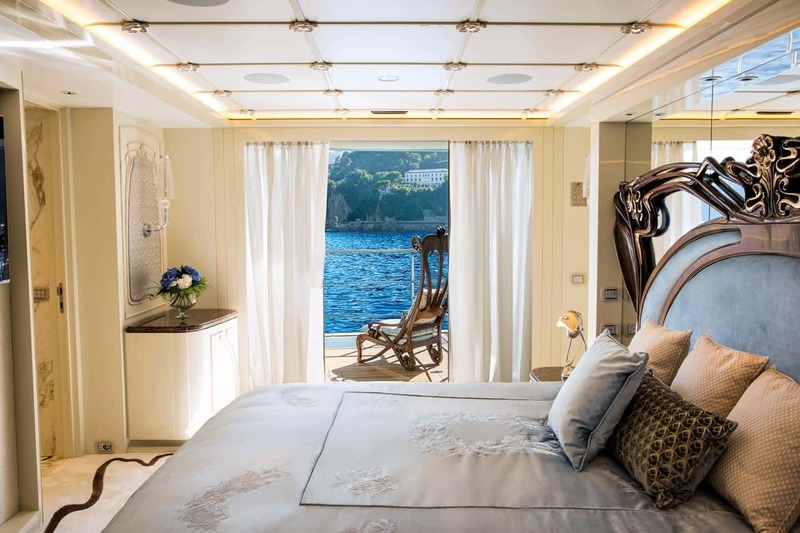 The master stateroom impresses for the countless hand-made details, such as the bed headboard in dark walnut wood and light-blue velvet, the soft and sinuous lines of the furniture, the white wool and silk carpeting decorated with the dark brown embroidery that runs across the entire yacht, and the elegant appliques in blown glass. On the right-hand side of the suite is a spacious, exclusive private terrace offering a magnificent view of the sea. Inside the suite, two entrances allow to gain access to the bathroom for him and for her, entirely in magnificent bright Carrara marble. The large circular hydromassage tub and the walkthrough shower are located in the central part of the bathroom, while the finely elegant taps and the doors in processed glass with haut- and bas-relief decorations are all stylishly harmonised details that add a truly unique touch to this room. The Latona is a peaceful, luxurious haven, the peak of CRN’s innovative solutions being reached in the lower deck aft area, which has been turned into a large, exclusive open-air living area integrated with the beach club – over 70 square meters allowing space to enjoy moments of pure celebration both indoor and outdoor. Children can also have fun in the sea-water indoor pool – also featuring a precious blue and turquoise mosaic – that becomes a garage for the tender when the yacht is cruising. The lower deck also hosts the four guest cabins. Two double VIP cabins can be found aft and two twin cabins are located at the bow. All cabins are ensuite, with bathrooms sharing the same style as the Owner’s, from the fine marbles to the large showers with a seat. Reaching the upper deck, guests are welcomed into a large salon devoted to music. Thanks to the wide side windows and the glazed surfaces opening up to 120°, the music salon is very bright and offers breathtaking views of the surrounding landscape. Outdoor, guests can find the al fresco dining area, featuring a fully-customized teak table in Liberty style, a bar, and a lovely open-air tea room, the real jewel on this deck. Two large sun pads complete this area, while the inflatable climbing wall will undoubtedly offer unforgettable and exciting adventures. The upper deck lobby is covered by a skylight that lets in plenty of light directly from the sundeck. Walking further towards the bow, the Captain’s cabin and office can be reached, followed by the navigation bridge. The living area and the solarium located in the forward part of the yacht are very large and comfortable. This area also features the concealed garage for the rescue boat – located under a huge sun pad with cushions, a roll-out awning – and two jet skis. The sundeck, in typical Mediterranean style, is made up of three ideally-separate but physically-uninterrupted areas that unite to become one single open space: the dining area, the forward sunbathing area fitted with a Jacuzzi, and the aft solarium, furnished with four sunbeds and an imposing sunbathing area that develops vertically, remains isolated from the rest of the deck and therefore ideal for total relaxation. The inflatable slide, one of the family’s favourite toys, is deployed on one side towards the stern, while the central area, conceived to enjoy the pleasure of sharing meals with the family’s dear ones, also features a pleasant water mist system installed in the ceiling to cool this area when needed. A barbecue and an American Bar can also be found here. Onboard comfort is ensured by latest-generation home automation solutions, allowing control of the audio-video system, the lights, as well as the decorative and black-out curtains using the i-Pads installed in all areas and rooms or directly from one’s own device after downloading the dedicated app. Thanks to two Caterpillar C32 1081kW @ 2300 rpm engines, the yacht can reach a maximum speed of 16 knots and a cruising speed of 14 knots.